Accessories and optional add-ons provide a great way to personalise your Campervan or Motorhome. Below are just some of the options we have available to ensure your Campervan or Motorhome is fully equipped with everything you may need. The ultimate power adapter for RV owners and caravanners. Tough and weatherproof, it lets 15A devices, such as your motorhome or campervan, connect legally to 10A power points and includes fast acting earth leakage safety protection. Full size broom contracts to store compactly. Soft-bristled head adjusts to different angles for maximum cleaning power. Handle length is also adjustable. Dustpan clips onto broom handle for storage. Fits RV sinks and is the perfect size for limited counter space. The sloped drainer tray keeps counters dry. The drain tray snaps on top of rack for handy storage. Durable heavy-duty construction. Measures 9.50” x 11.69” x 4.75”. Coast’s range of sunscreens have been redesigned and are now a stronger and more functional sunscreen. The front and side sunscreens now feature an improved spline that won’t kink over time. There are also newly added reinforcing triangles (with D-rings) that enable the sunscreen to be secured to awning legs. They are quick and easy to fit and there are a number of different sizes to choose from. The Inline has a dual purpose – it can be used on your hose to fill your tanks and also when you are connected directly to mains water. It is simple to use and connects to your drinking water/filling hose in less than a minute. Designed for use in compact spaces, this fan’s foldaway gimbal mechanism directs its output in any direction, and permits it to fold away flat against the bulkhead when not in use. 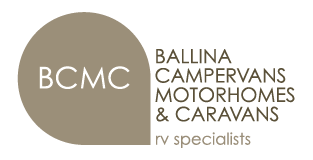 BCMC provides a long list of additional options for Frontline Campervans to suit your camping and travelling needs. The list below is an overview of the types of options available for both the VW and Toyota Hiace Frontline Campervans. TV Antenna system, microwave, hot water system, additional reading lights and a host of other appliances are available for your Frontline Campervan. Solar power, fuse control panel, additional battery, battery charger are some of the options available to you. Roof Bed and insect repelling fly screens are just a couple of the options you can choose from to suit your needs. Wind out awning, canvas side tent and/or rear door tent are available to make your Frontline Campervan a home away from home. Towing, protection bars, bull bars, window tinting and window upgrades, colours, van striping, reversing sensors, bike rack, roof racks … the list goes on!